For the last 7 years, Woman2Woman has been hosting this special event and blessing a reader with something special…and this year that may be YOU! I consider it an exciting opportunity to be a part of this event and I hope one of “my” readers may be a lucky winner this go-round. Share this post with a friend and give them a chance, too. This giveaway is in no way sponsored, endorsed, or associated by Facebook, Instagram, Twitter, or Pinterest. 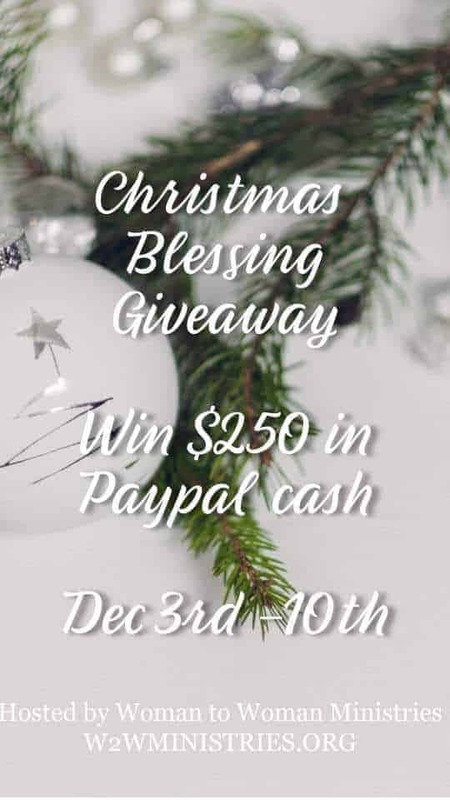 By entering this giveaway, you agree to release Facebook, Instagram, Twitter, Pinterest, Woman to Woman Ministries, and all participating bloggers of all liability. Contest ends at 12:01 am EST on December 11, 2018. The winning entry will be verified. The winner is randomly chosen by Rafflecopter and will be emailed.